The Garden of the Ediacaran was a period in the ancient past when Earth's shallow seas were populated with a bewildering variety of enigmatic, soft-bodied creatures. Scientists have pictured it as a tranquil, almost idyllic interlude that lasted from 635 to 540 million years ago. But a new interdisciplinary study suggests that the organisms living at the time may have been much more dynamic than experts have thought. Scientists have found It extremely difficult to fit these Precambrian species into the tree of life. That is because they lived in a time before organisms developed the ability to make shells or bones. As a result, they didn't leave much fossil evidence of their existence behind, and even less evidence that they moved around. So, experts have generally concluded that virtually all of the Ediacarans—with the possible exception of a few organisms similar to jellyfish that floated about—were stationary and lived out their adult lives fixed in one place on the sea floor. 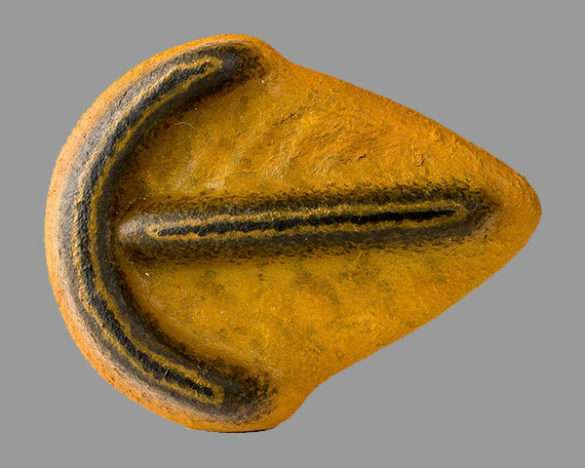 The new findings concern one of the most enigmatic of the Ediacaran genera, a penny-sized organism called Parvancorina, which ischaracterized by a series of ridges on its back that form the shape of a tiny anchor. By analyzing the way in which water flows around Parvancorina's body, an international team of researchers has concluded that these ancient creatures must have been mobile: specifically, they must have had the ability to orient themselves to face into the current flowing around them. That would make them the oldest species known to possess this capability, which scientists call rheotaxis. "Our analysis shows that the amount of drag produced with the current flowing from front to back is substantially less than that flowing from side to side," said Simon Darroch, assistant professor of earth and environmental sciences at Vanderbilt University, who headed the study. "In the strong currents characteristic of shallow ocean environments, that means Parvancorina would have benefited greatly from adjusting its position to face the direction of the flow." 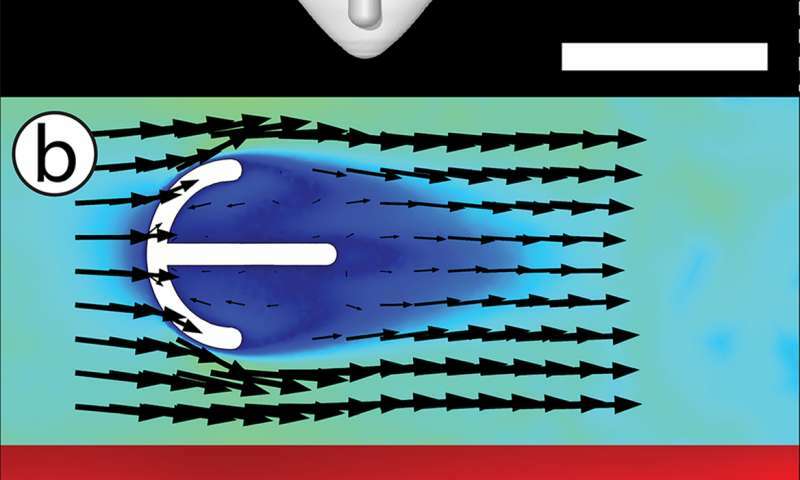 The analysis, which used a technique borrowed from engineering called computational fluid dynamics (CFD), also showed that when Parvancorina faced into the current, its shape created eddy currents that were directed to several specific locations on its body. "This would be very beneficial to Parvancorina if it was a suspension feeder as we suspect because it would have concentrated the suspended organic material making it easier to consume," Darroch said. Details of the analysis are described in a paper titled "Inference of facultative mobility in the enigmatic Ediacaran organism Parvancorina" published online May 17 by the Royal Society journal Biology Letters. These conclusions are reinforced by an independent study performed by a team of Australian researchers published March 30 in the journal Scientific Reports. Analyzing an Ediacaran site in South Australia, they found that the Parvancorina fossils were preferentially aligned in the direction of the prevailing current and determined that this alignment was not passive but represented a rheotactic response at some point in the organism's life history. "We decided to stop trying to figure out where these species fit in the tree of life and to try to determine how they were shaped by evolutionary forces," said Darroch. "We wanted to understand how their weird architectures affected how they ate, reproduced and moved. Because they lived in a shallow sea environment, strong currents must have played a major role in their evolution. So computational fluid dynamics is the perfect tool for addressing this question." According to team member Imran Rahman, research fellow at the Oxford University Museum of Natural History, CFD has been used to analyze the design and optimize the performance of a wide variety of structures and machines, ranging from nuclear reactors to aircraft, but it is only in the last few years that they have begun applying it to study the fossil record: "CFD has the potential to transform our understanding of how ancient organisms fed and moved, so I would anticipate that many more paleontologists will start making use of the method in coming years." "When you sit back and think about it, we are virtually recreating ancient oceans, and populating them with digital representations of long extinct organisms that have defied our understanding for over 50 years in order to gain insight on how they lived their day to day lives," added co-author Marc Laflamme, assistant professor of earth science at the University of Toronto Mississauga. "This kind of work would not have been feasible even a decade ago, and I believe it represents the direction that modern paleontology is forging." "The fact that we have now established that one Ediacaran species could move around suggests that our picture of this period may be fundamentally wrong," said Darroch. "There may have been a lot more movement going on than we thought and we intend to apply this technique to other Ediacaran fossils to determine if that was the case."